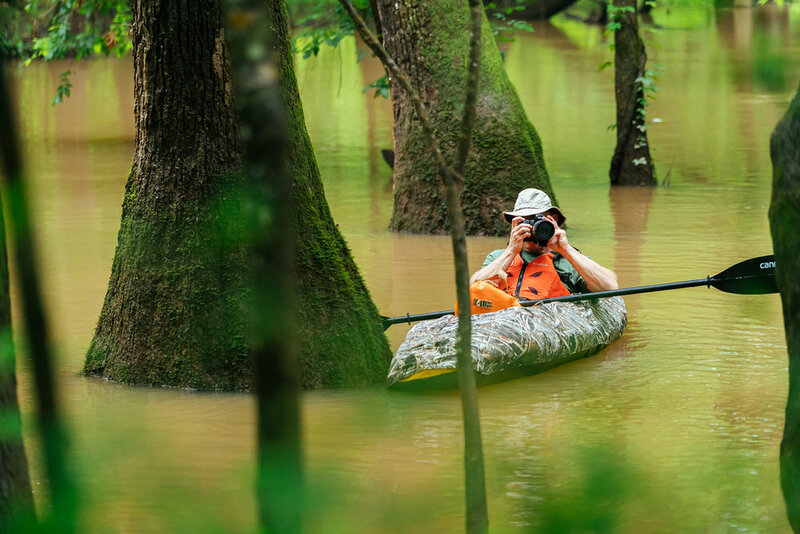 When thinking about your next kayaking adventure, the South may not be the first destination that springs to mind. The drama of the Colorado River may pop up instead, or the beautiful landscapes and rushing rivers of Utah. But don’t dismiss the South so quickly. Each region holds different beauty and gems found hidden in the area. Swampy boat rides, exotic birdlife, and sneaky crocodiles are just some of the things to look out for in the South. Head over to one of these swampy areas on your next boating adventure. Local tip: don’t forget some sunscreen and all the bug spray as our mozzies don't mess about! The Florida Everglades are home to coastal mangroves, sawgrass marshes and pine flatwoods acting as a home to hundreds of animal species. Among the Everglades' abundant wildlife are the endangered leatherback turtle, Florida panthers, and the American crocodile. When kayaking in any Southern area, bugs (like mosquitoes) can be your worst nightmare. There is no exception in the humidity of the Everglades. In addition to the bugs and crocodiles, it's helpful to be aware of the various poisonous plants in the area. If you are planning to kayak and camp overnight, we strongly suggest keeping away from any vegetation you don't immediately recognize. Better safe than sorry! It may just be us, but he name ‘sparkleberry’ makes the place sound full of wonders! Sparkleberry Swamp lies on the upper portion of Marion Lake in Rimini, South Carolina. The name was taken after a tree abundant in the area, the Sparkleberry Tree (makes sense). This is a great spot to head out fishing for the day with an abundance of catfish and bass. Just leave the alligators off the menu! Be on the lookout for herons, ducks, egrets, and other bird life along the way. Looking for a hidden Georgia retreat? George L. Smith Park has natural beauty, lakeside camping, and cozy cottages for you and the whole family to enjoy a weekend away from the city. With plenty to do, this is the perfect vacation spot to get away from the crowds. Enjoy the beauties of the South with Spanish moss and countless Cypress trees. PRO TIP: Pack up your portable kayak to avoid rental costs and enjoy the comfort of your own boat. The K-PAK Folding Boat packs perfectly inside any car for your road trip without the hassles of getting the boat on the roof of the vehicle! Smooth sailing. Delnor-Wiggins Pass State Park is one of the last remaining undeveloped barrier islands on Florida’s Gulf Coast. Talk about a hidden gem! When you picture your perfect beach, it likely looks like one you can find here: unspoiled, plenty of room to spread out on the sand, and clear, warm water for swimming, fishing, and kayaking. 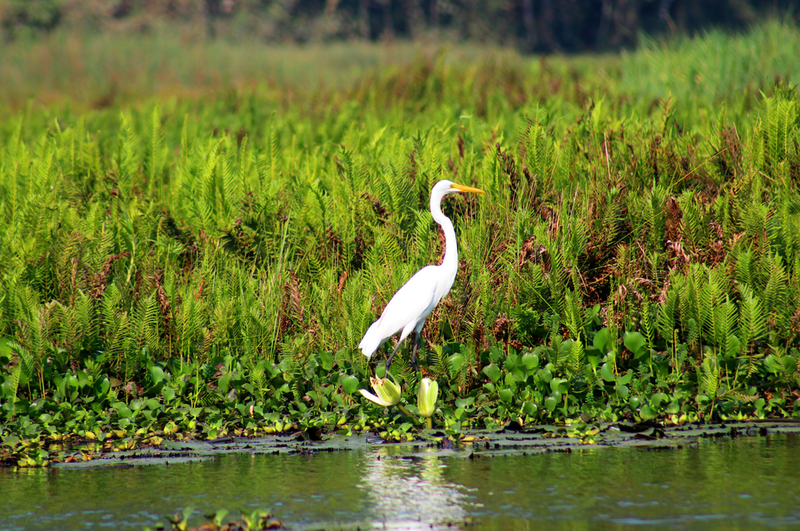 Get out on the water with your kayak to experience the vast bird life that inhabits this area. Ever been on a trip where ‘keeping your elbows away from the water’ was the number one rule of the river? Welcome to the Okefenokee Swamp in south Georgia. This peat-filled wetland straddles the Georgia–Florida line in the southern United States. A majority of the swamp is protected by the Okefenokee National Wildlife Refuge and the Okefenokee Wilderness. This area is perfect if you are looking to change up the scenery and dive into some different waters (not literally of course!). Bring your binoculars to check out the various bird species in the area, sunscreen for the hot sun, and some strong bug spray. While the bugs are one hazard to look out for, always be on guard for the alligators that roam this territory too. From feeding frenzies to solo hunters lurking in the shallow water, this is not the place to jump in for a dip! 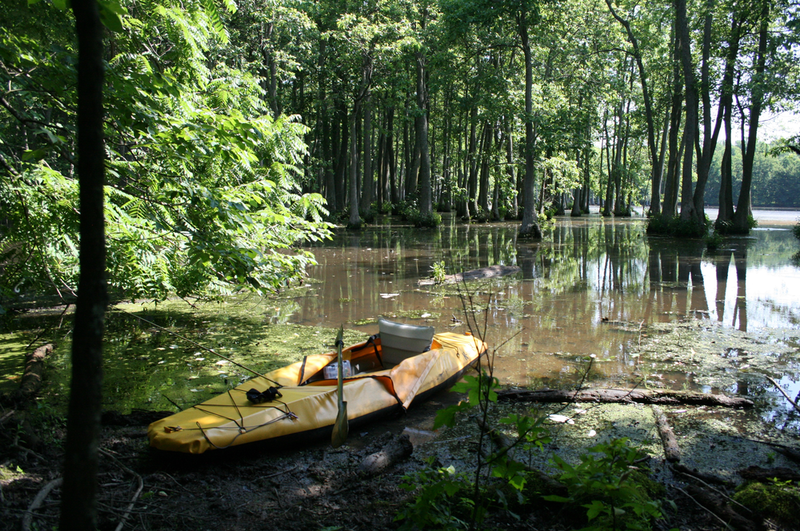 Stumphole Swamp is an open lake made for easy-going paddling and easy to navigate waterways. The biggest attraction here – Ospreys. Theses birds can be seen soaring overhead in large circles, showing off their distinctive white coloring and impressive 4-6 foot wingspan. Given their diet is 99 percent fish, it’s no wonder they’ve taken a liking to Lake Marion! This area is known for its abundance of striped and largemouth bass, crappie, bream and catfish. 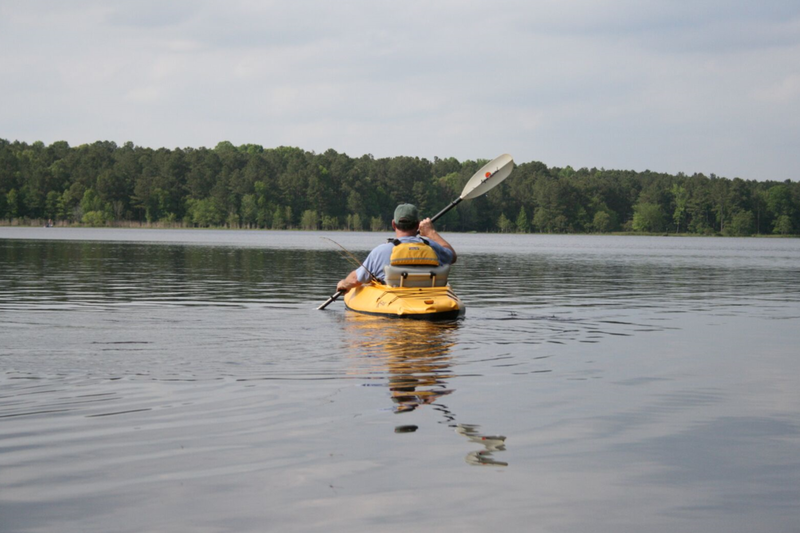 Head over to Stumphole Landing in Calhoun County, South Carolina to park and get your boat in the water! Fun name, right? Add this one to your checklist as The Great Dismal Swamp National Wildlife Refuge is the largest intact remnant of the old habitat that once covered more than one million acres of southeastern Virginia and northeastern North Carolina. This old ecosystem has grown and transformed over the years to become the popular place it is today. Keep an eye out for wildlife and enjoy some of the 112,000 acres the refuge has to offer. On summer weekends you can find the local community gathering at Okatoma Creek for some kayaking fun! With everything from rivers for the experienced kayaker, to class 1 rapids, this is the perfect river to cool off in the summer heat. Take in the scenery with a gentle float down this relaxing riverbend! Ocala National Forest is known for its large areas of sand pine scrub forest. The Florida scrub is unique to Florida and provides an interesting array of plant life. This area has everything you need for a fun kayak trip, including primitive camping as well as paid camping spots. Take a break from the sun and dip in the local cool springs! With a constant temperature of 72 degrees year around, the forest’s springs are magnets for people in summer and manatees in winter. Who doesn't love a good manatee?! Don’t be surprised if you see more 'gators than paddlers on the 150 meandering miles of this water trail system in southern ‘Bama. Venture out on one of the half-dozen day use trails or choose an overnight route and stay on a floating platform campsite. Just mind the delta’s five species of venomous snakes (water moccasin, coral snake and three varieties of rattlesnakes)! There you have it folks! 10 hidden, beautiful, and super fun Southern places to get out and explore via the water. What are you waiting for? Pack up your portable boat and let's go!